You may be interested in seeing the article published by CNN after they contacted me to analyze Trump, Hillary and Bernie’s handwriting. Prior to this interview I had written a post here about Trump’s handwriting. 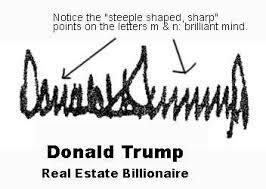 For years, graphologists have kept Donald Trump’s signature on our radar screen and in our files because we loved to comment on it. Heck, this was even before he was called “The Donald”. And certainly decades longer before the idea of his running for Presidency was just a gleam in someone’s eyes! To the best of my knowledge the one below is a more recent signature than in all past years. And yes yes yes…. I see changes. What hasn’t changed: His writing is and always will be very angular. Extreme angles in writing (especially in m’s and n’s) reveal an extremely rocket sharp, quick analytical mind. One who is quick to size up a situation. We’re talking lightening speed quick. Exploratory thinker, dissect an issue into oblivion, quick decision maker…..but the more angles, the more harsh in judgment. The more black and white thinking… I’m right, you’re wrong judgmental thinking. No one would ever accuse Mr. Trump of having soft, round or curvy handwriting. 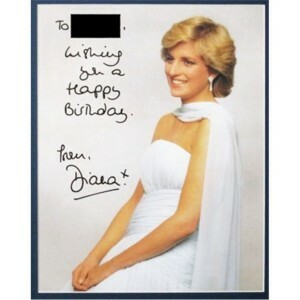 To clarify, think Princess Diana for rounded handwriting. What I immediately noticed about the newer signature were new secrecy strokes in the “o” and “d”. He is not writing as carefully or perfectly as before. (You could place a ruler under the first signature) And the slant has changed. Leaning right toward more impulsiveness. During this process, we make fun of all politicians equally. It helps us stay sane. I was interviewed by print and live media in the last several elections. 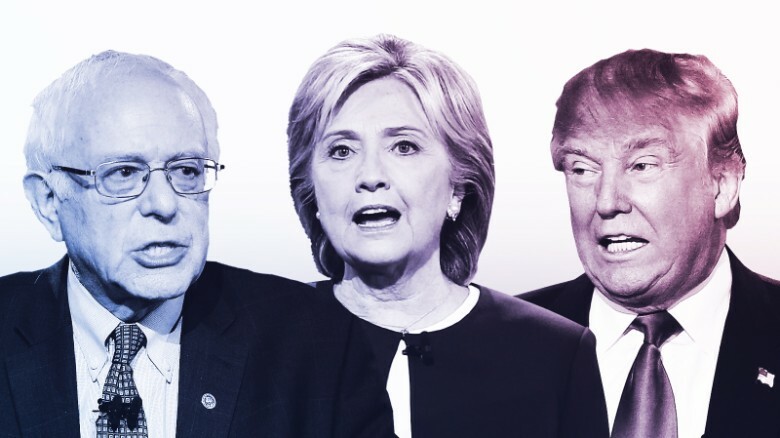 In my online signature analysis course we had some fun with the candidates for the 2008 candidates. Handwriting analysis is an ancient science that has been around since the days of Aristotle. The more you learn the more you want to learn, the more questions you have. Understanding graphology takes you on a learning journey of a lifetime. A signature shows the ego of the writer. A writer needs to write several lines on unlined white paper to make a proper assessment. Diana’s slow, rounded writing, shows a mentally lazy, cool-headed mind under control (straight up and down letters – no slant). Her looped letters are close to the same size of the other letters, showing a lack of ideology/idealism/spirituality. The lack of outgoing terminals indicate her degree of selfishness. Donald’s shows an intense, logical introvert (strong pressure/vitality, letters connected and close together) with much resistance, judgment and intelligence seen in the sharp letters that give him the determination and stamina for hard work. His slant is balanced between his mind and his heart, capable of normal affection. The lack of outgoing terminals, and especially the final “d” coming back to self before it heads down shows his degree of selfishness. (I rarely see inherent generosity in a script, especially in males). Yes, the o and a in “Donald” are closed loops, indicating a degree of impenetrability – a personality who is not comfortable sharing his inner world with others. But there is no peacock-type vanity seen in his script like the larger than life B and O of O’bama’s cool-headed male script (slant leans backwards; cold blooded – his letters connected showing male logic and lack of normal affection – no 45 degree slant.) Followed by very small, critical lower case letters that appear almost snake-like, the final ending terminal stroke pushes out in a downward slope away from the other letters, indicating his degree of selfishness wants his own way with a tendency to push things away from self). 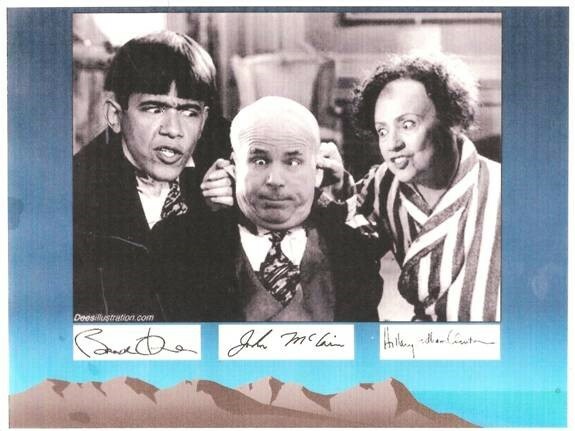 John McCain shows me a sensitive (far forward slant), critical/analytical (small writing) introvert (letters close together. 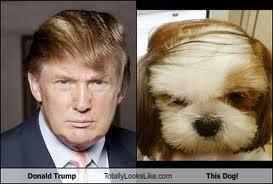 He would be well suited to work long hours behind a desk. Hillary’s signature, with the large H and C, followed by small, critical small letter shows another example of a cool headed, critical mind that has a tendency to push things away, seen in the final terminal stroke on “Clinton.” It appears she has flashes of intuition (breaks in between the letters) which can make her a good judge of character, but because of her degree of selfishness (lack of outgoing terminals such as the “y”) the intuition can be used to benefit the self. There is really not enough featured here to make any more comments. My uncle, Joe Stanovich, who taught me enough to find the integrity in a script, was an associate of DeWitt B.Lucas, the pioneer of the Science of Handwriting.